Add your link to any or all of the Social Media Follow Groups below! Follow as many people as you would like and be certain to leave a comment on their page to let them know you are a fan! Please be certain to follow your hostesses. Your presence and participation is appreciated and we will always follow you back! We'd love for you to grab the Take Over Tuesday button to display on your site! Would you like to be our Guest Host? 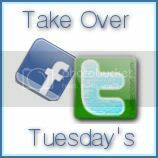 Take Over Tuesdays Social Media Hop!